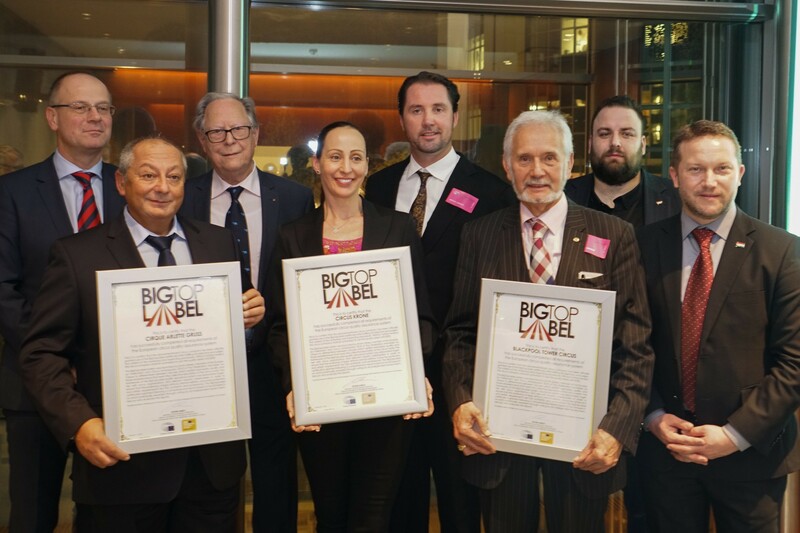 „This is the Michelin-star of circus arts” – said the initiator of the BigTopLabel-programme in the European Parliament after the first awarding ceremony of the prize acknowledging European circuses. Istvan Ujhelyi, member of the European Parliament, suggested the establishment of an objective quality assurance system that differentiates between the various circus ensembles and institutions. Only those circuses receive this acknowledgement that fulfill the conditions set up by competent professional associations and experts of the European Parliament, including: legal requirements, employee and consumer protection rights, artistic standards, and strict animal welfare aspects. Under the framework of this programme, detailed reports are prepared for all inspected circuses which are then evaluated by an independent jury of circus professionals who decide which circus is rawarded the BigTopLabel recognition. The quality assurance system is officially part of the 2018 European Year of Cultural Heritage. This year three prominent circuses received the award: Cirque Arlette Gruss of France, Circus Krone of Germany, and the Blackpool Tower Circus from Great Britain. The BigTopLabel recognitions were presented this year in the European Parliament by MEP Istvan Ujhelyi and Tibor Navracsics, European Commissioner for Education Cuture, Youth and Sport. During the ceremony, MEP Ujhelyi said that awarding the first BigTopLabels is a worthy finale for 2018 -the very year that marks the 250th anniversary of modern circus. „We must be able to defend our cultural values and artistic traditions while simultaneously fulfilling all the strict contemporary requirements – for instance concerning animal welfare measures. The BigTopLabel system seeks to point out and highlight the good examples which exhibit outstanding quality both from a cultural and humane sentiment” – noted Mr Ujhelyi. The project will continue next year as well with another three applying circuses that will undergo a comprehensive objective and subjective inspection procedure. Initiators of the BigTopLabel expect that this quality assurance system will outgrow Europe and shall serve as a recognition for good quality circuses worldwide.